I’ve been drawing a lot recently and had a fair few people say I should do commissions. One of them being SnakeDoctor. He spoke to me about perhaps doing something for a new series before Minevention, then few weeks after the event commissioned me to do this. Now this is the art used for the CrazyCrafters Season 2 thumbnails. Am I chuffed? Yeah I could say I am. Anyway here’s the speed art. Sorry I’m so bad at updating my videos to here, I really should get better at that! I’m a mother, but I’m also a gamer so this may not be exactly how parents who are not in to Minecraft or video games feel but I like to share my love for video games with my family and Minecraft is just one of the many games we enjoy together. 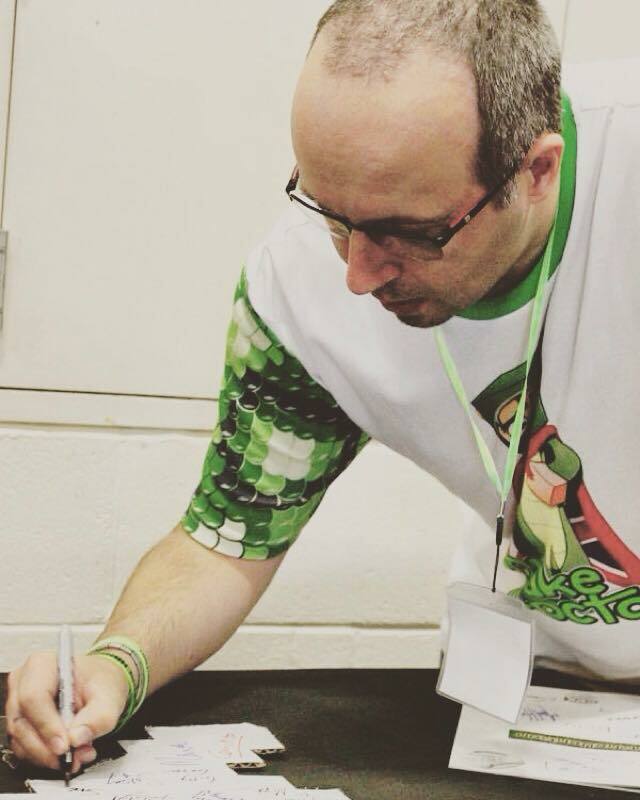 I was lucky to go to Minevention with my son whose point of view I posted about yesterday. 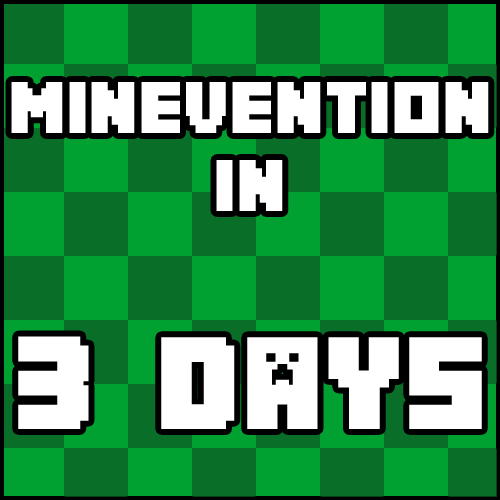 Today I shall talk about my thoughts on Minevention. Peterborough Arena wasn’t exactly Sat-Nav friendly. After a few times of our sat nav trying to force us through a solid metal gate we decided to follow “show ground” as I realised the arena use to be called something else in the past. We got there and inside the hall we saw Razer had sponsored a large gaming area where could do Hunger Games tournaments, the Razer bus was there as well and then in the middle was CEX with laptops, free chocolates and also competitions. Just right of the main entrance was many amazing charities and educational companies who could talk to about gaming and Minecraft as well as coding in general. Special Effects were also there which was fantastic. Left of the entrance was an area where talks would happen and then areas further in for Q&A’s, signings, Future YouTubers, retro arcade games and a few merchandise stalls. Also loads of bean bags which were super comfy for when you had been running round and having fun all day. Firstly let me talk about the YouTubers. They went above and beyond during Minevention to keep everyone happy. Many were on the event floor simply meeting fans, signing and having photographs taken. You would never see it at any other event, not without paying a huge price tag for entry. The Q&A’s that they did in groups were great. They answered all the questions given to them and even made the fans laugh a few times. 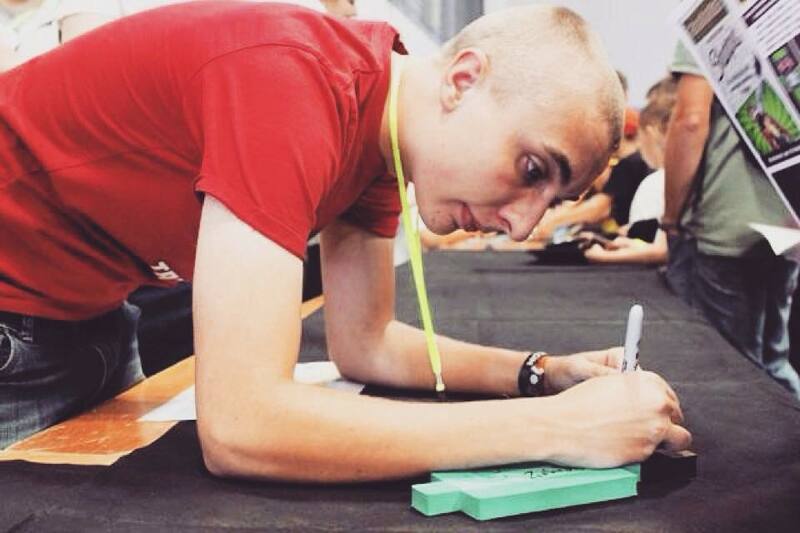 The signing queues were long, but considering they were for free I did expect this to be the case and I think many parents who perhaps don’t take an interest in what their kids watch and who these people are didn’t realise that these YouTubers are essentially celebrities to children of today. 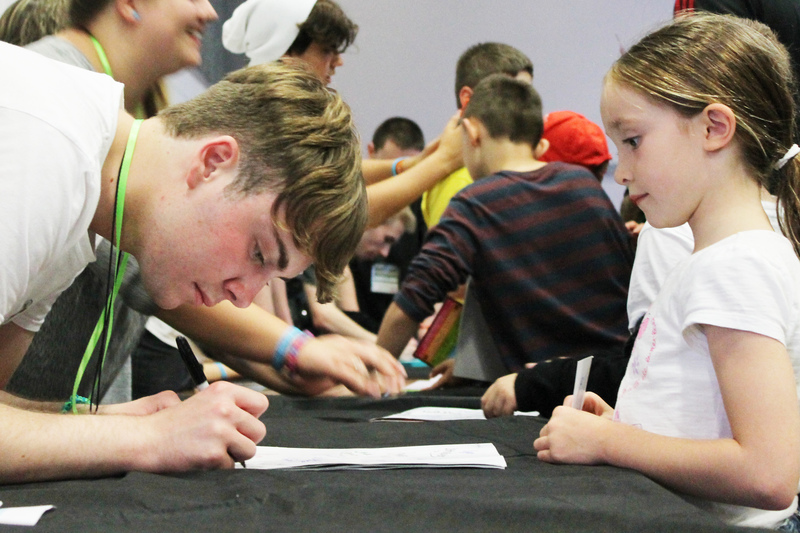 If hundreds of children want to meet their favourite YouTuber then chances are there’s gonna be a bit of a queue. But again YouTubers took it on themselves to take on extra time to sign stuff. Time time celebrities certainly would never do that! They were signing everything handed to them from foam diamond pick axes to t-shirts to plush toys. I also ended up signing a few things which was an odd experience for me but was very sweet too. The games available sadly were only PC. I think this was a bit of a shame as many children will have only played the console edition. Perhaps something could be sorted for next year, otherwise it was fairly tricky as parents tried to show their kids the ways of the WASD. Or perhaps Razer could have had some of their awesome gaming controllers connected so children who are best with controllers had a better chance of having fun. The arcade games were a great idea. Who says old games aren’t cool anymore? Children as young as my son, teenagers and even parents were teaming up and playing Frogger, Pac-Man and Street Fighter. there was even a Dance Dance Revolution game. I tried to get back in to playing that but I very quickly got reminded I am not as fit as I use to be. Though must say I was evil a beat a few kids, bwahaha. 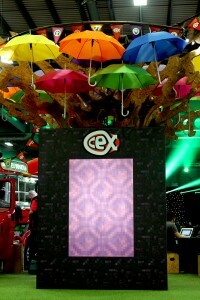 CEX had an amazing Nether Portal and if you had a photograph taken by their staff, you would be entered in to a competition. Plus they had barrels of chocolates, and I’m not kidding they were actual barrels filled with chocolates. Downside? There was meant to be a lot more food by the entrance, it seemed the arena decided two food stands was enough for thousands of people. And as I said earlier some consoles or even controllers for the PCs for the younger kids would have been a good idea. But for a first time event here in the UK I think it went pretty well and would love to come back next year! I have always been disheartened that the only Minecraft event seems to be Minecon, the official event which Mojang run and sadly is out of our league when it comes to ticket prices. So when I heard Minevention was coming to Peterborough I knew we had to go there, specially when the tickets were several digits less and wouldn’t make a family’s bank balance cry. So I took my five year old son with me and off we went to enjoy a day of Minecraft. I’m going to put this into two parts, one from the point of view of a young child and one from the point of view of a parent. It seems only fair to give both opinions and hopefully give you a good idea of what the event was like for both of us rather than just as the parent which I’m seeing a lot of on social media. So we’ll start with my son’s views of the event. My son had no idea he was going until Saturday morning. Originally I planned to tell him at the front door but his daddy let slip, whoops! Thankfully that didn’t stop him having a good day. He was very lucky to be at the first Q&A and SnakeDoctor let him ask about what consoles do they play Minecraft on. The YouTubers there were so kind and happily answered the question for him and then signed his Minecraft torch for him. He was a bit shy in asking and sort of just waved the torch at them, but followed it with a “thank you”. We checked out the Hunger Games as he was adamant he could do them, even when he has never played Minecraft PC edition and the concept of WASD may as well have been another language to him. He did try, lastest about a minute each time but that didn’t matter to him. He loved wearing the Razer headset to the point he kept saying “look at me, mummy! Take a picture of me!” whilst grinning like a cheshire cat. Next he wanted to play the retro arcade games. I was surprised by this but also pretty proud. Being a gamer of the 80’s and 90’s I knew many of these games and played many hours of them so was more than happy to let him have a go. 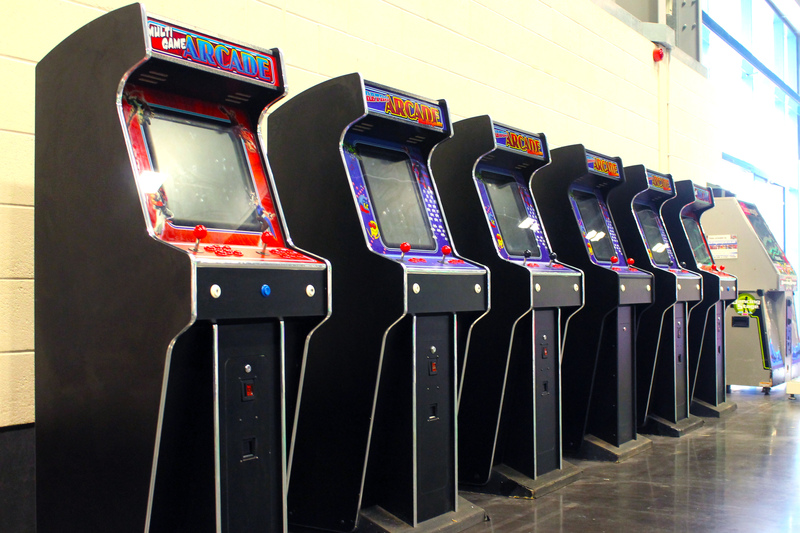 They were all free-to-play, no coins required! He tried Frogger and Street Fighter, he absolutely loved Street Fighter, probably as much as I did when I was a kid. We then got to chat with Wizard Keen who happily signed his torch for him. Again my son was in awe, he had watched Wonder Quest and had probably re-watched the show more times then I have fingers and toes (so more than 20 times then!) and now he was meeting the bearded wizard of Wonderberg. Afterwards he looked at his torch and said “Wizard Keen wrote on my torch, mummy. That’s pretty cool”. Yes, it was indeed. My son decided at 1pm when we were due to go outside to take photographs that he needed more food, even though we had food not long ago and he even said “I’m most certain I am very full” and I was forced to eat the leftovers. Sadly there was a queue that lasted an hour and all he asked for was some cake. I bought loads of stuff though which he ended up eating. He wasn’t a fan of the long waiting for food and didn’t really get why you can’t just skip queues. Later he got to meet AshDubh who also signed his torch and asked him if he plays Destiny. Sadly no he doesn’t, but if you ever read this AshDubh, go buy it! That’s an order mostly from him, I’m just the messenger. We did however get trapped as hoards of fans refused to move away from the door. Thankfully AshDubh kept the fans busy whilst we used the fire exit to get out. 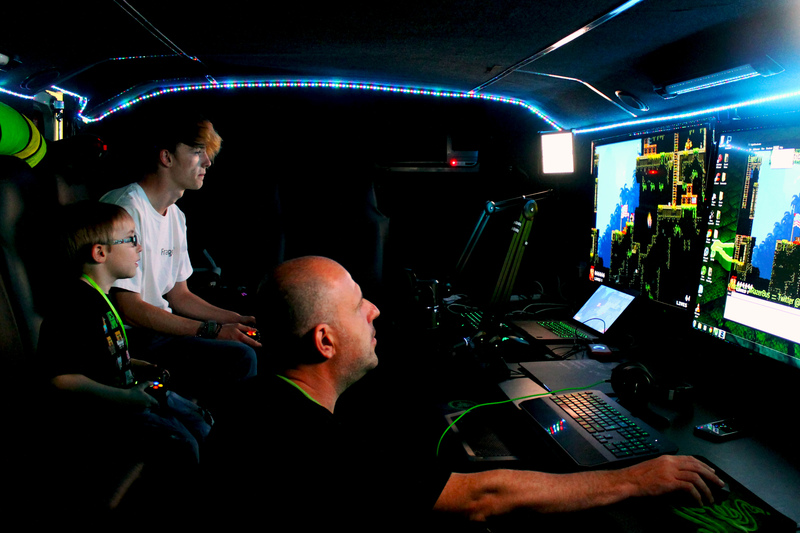 We then visited Razer’s Bus. The lovely folks invited my son to sit with them and play a game (which I wish I knew the name of as he loved it!) and I got a sneak look at their beautiful Twitch set-up. I may have been a tad jealous and drooled over the keyboard a tad. He didn’t want to leave the bus but time was running out and it was only fair to let others have fun on the bus as well. We then met NettyPlays. I was surprised she knew who I was, it was lovely to give her a hug and talk to her for a bit. She signed his torch for him and he was very chuffed. Wished we could have talked to her for longer but was only fairly to allow others to meet her as well. The day started to calm down, we had a lovely chat with Tomohawk, TycerX, FormallyMyles and oh gosh so many people! 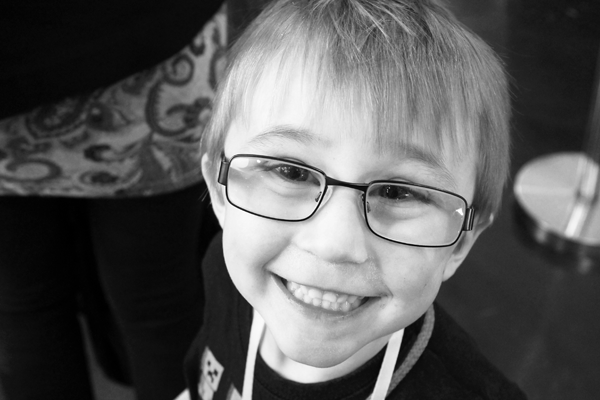 He was happy that SolidarityGaming liked his new Avengers glasses and he got to meet everyone he wanted to meet. Plus we ended it with a trip to Mc Donalds. So what did my son think of Minevention? Loved it. He was a bit disappointed in the lack of console version of Minecraft, but otherwise he had the time of his life. Coming up… A mother’s point of view! Come back tomorrow to see what I thought about Minevention. So I’m packing my gear and heading to Minevention on Friday. I’m mixing it up with doing some actual work (I’m there as Press!) with some fun as I will have my son with me who no doubt will want to meet every single one of his favourite YouTubers and play games. I’m hoping to try and periscope some of the stuff happening there, but depends on signal and if my phone will be cool with periscope minus a Wi-fi connection. If not I do hope to get some videos done, most certainly a ton of photographs. If you are not already going to Minevention but you’re a Minecraft fan or a parent of a Minecraft kid then you really should get tickets! You can still get hold of standard tickets on the day. It’ll be worth it, promise!